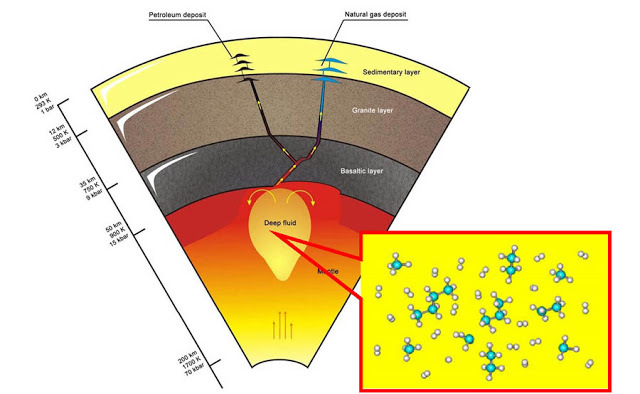 Japanese researchers at Okayama University have unlocked some the mysteries of how methane is stored and released from methane hydrates. 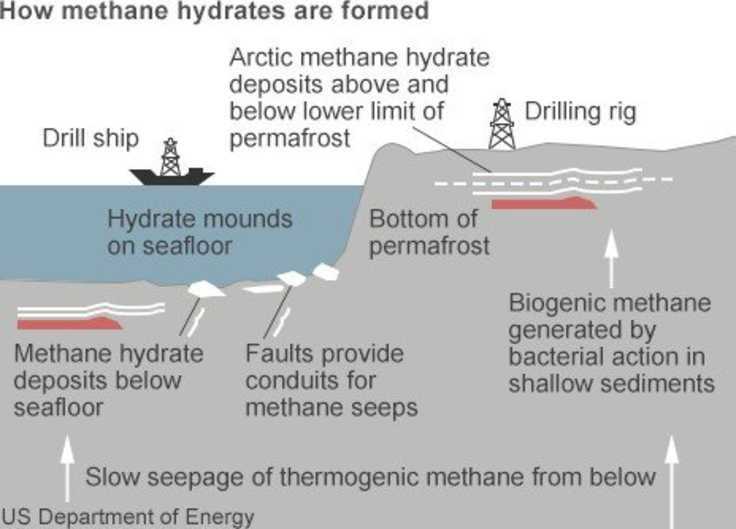 Methane hydrates are formed in sediments around the world, and have been most frequently found in sedimentary deposits along continental margins. Some recent estimates of the size of the global methane hydrate reservoir have been scaled down from earlier estimates. But such “minimalist” estimates fail to take into account the regenerative nature of underlying natural gas which eventually becomes methane hydrate (or clathrate). 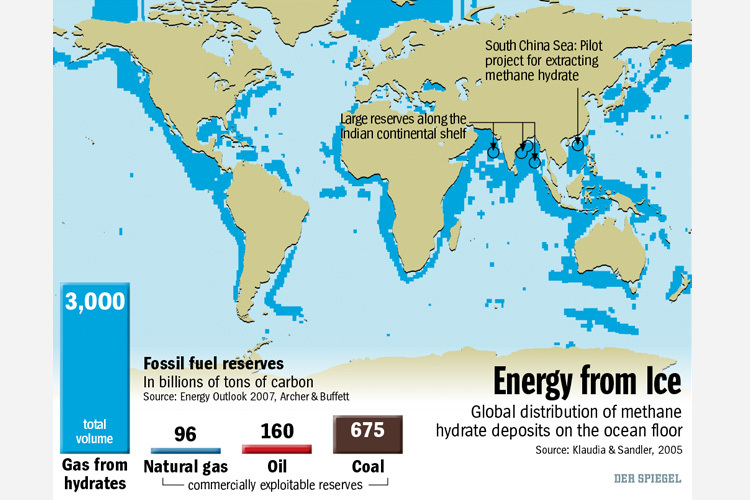 There are at least two ways in which methane hydrates and continental shelf methane can be seen as renewable. First, abiogenic methane is constantly being generated in the mantle, much of which moves upward into crustal layers and sediments. Second, biogenic methane is constantly generated by methanogenic microbes in seafloor sediments, from organic matter always forms a part of ocean sedimentary layers. Some information on biotic vs abiotic methane. Methane “reservoir levels” are a moving target. Just when you think you have it figured out, you get hit in the head by something you didn’t know was there. The same is true for oil & coal resources. A study on seafloor methane seeps and their effect on oxygen consumption. We should keep in mind that undersea oil & gas seeps are a natural part of the undersea ecosystem worldwide. Entire biomass ecosystems have evolved to deal with this ever present phenomenon. Meanwhile, here is what Obama is doing about US oil & gas production, while he is claiming to be doing something entirely different. How you know a politician is lying, is when you see his mouth moving and hear sounds coming out of it. He has other ways of lying, of course, but that is one good way to know. This entry was posted in Energy and tagged Methane Hydrates. Bookmark the permalink. Putin claims Russia’s budgetary break even point for oil is $85 to $90 per bbl, not the $125/bbl you have estimated. He thinks Saudi Arabia’s break even point is about the same. By the way, abiogenic oil and gas was Thomas Gold’s pet theory, but as I recall most geologists disagreed with him. Are there any recent developments in this area? Putin said that? Well, let me think . . . Putin is a politician. The way you know if politicians are lying, is if their mouths move and you hear sounds coming out. “My” estimate of $125 bbl breakeven for Russia’s budget is probably on the low end, particularly after Tsar Vlad’s brave new spending programs. But seriously, folks. Oil & gas prices are an existential question for the Russian government. Putin has bet it all on oil & gas prices. If the government is overextended on that front, do we expect Putin to be honest about it — at this time of all times? Clearly not. Neville Chamberlain trusted Hitler, and see where that got him. Putin is making many of the same moves as did Hitler, but Putin has better economic reasons for what he is doing. Abiotic gas (methane, ethane, propane) is an exciting field of hydrocarbon geology on Earth and other planets. Abiotic oil is something quite different, involving longer chain carbons which have greater difficulty surviving in the conditions dominant in most of the mantle. The link above provides a pointer to a recent classic paper in the theory. You might be interested to know that the leading theory for the earliest bacterium is that it was a methanogen using hydrogen from natural iron oxidation processes to reduce carbon dioxide. Bacteria only catalyze reactions that occur spontaneously (thermodynamic sense) but slowly. Descendants of these early methanogens still exist and make up the great majority of all methanogen bacteria (actually archaea) and are believed to be a major source of methane in various environments, including deep rocks. I wonder if in situ electric generation might provide early economy for CH4*n(H2O) exploitation. Basically, what you do is take advantage of the low temperature of the hydrate’s environment as a heat sink in a carnot cycle that burns the hydrate. By dumping heat into the hydrate’s environment, you liberate more CH4. Since you are at-depth already, sequestering CO2 as liquid in situ should be far economical if it is ever going to be. The biggest capital expense would be the air pipe from the surface and the biggest operational expense would be the air compressor. I have no idea how expensive or cheap the electricity at the air intake would be but one thing is for certain: it would be baseload. Another thing occurs to me: The integration of Ocean Thermal Energy Conversion. The largest expense of OTEC, like the aforementioned CH4*n(H2O) burner, is the pipe from the surface to the cooling depth*. In addition, during compression of the air for the hydrate burner, heat will be liberated along the length of the air pipe (presumably this compression will be done in stages). On the way back up to the surface, cold N2 would be depressurized and heated. These heat and pressure changes could regeneratively drive the compression stages. *This also points to a potential environmental problem with macroengineering-scale deployment of OTEC: What if it heated up the deep ocean and caused a mass extinction event like the Permian?